The Golden Mickeys is Disney’s version of the Academy Awards and is held in the Walt Disney Theatre on deck 4. Get ready to feel like a celebrity as you approach the magnificent 977-seat showplace featuring elaborate lighting sets and state-of-the-art technical facilities, along the red carpet complete with paparazzi, a roving reporter and live "celebrity" interviews broadcast on giant video screens inside the theatre. This is a spectacular show celebrating the musical legacy of Walt Disney Studios. Once inside, there are stars, including Tim Allen, who speaks to guests through taped video; live performances, including the award-winning "Son of Man" from Disney's Tarzan soundtrack; elaborate sets, including dramatic Chinese silk drops, mysterious "lakes" of fog and eye-popping animated backdrops; and even a few characters. 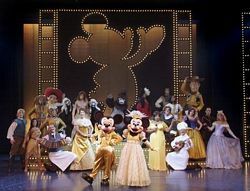 The performance combines live-action theatre with film, video, music and colorful pyrotechnics in a toe-tapping salute to Walt Disney and his legacy of classic animated films. It's all the glitz and glamour of a Hollywood tribute, honoring the comedy, romance, heroes (and even villains) of your favorite Disney films. The Golden Mickeys is a lively combination of theatrical song and dance, animated film, video and special effects. Some 200 singers, dancers, actors, comedians, Disney characters entertain guests nightly. The show is a fast 45 minutes of song, dance and filmed segments of comedy, romance, heroes and villains. Disney has taken into account that while there is always an audience for the classics, there is a younger crowd that is familiar with the more modern classics. Although based on timeless classics, The Golden Mickeys does not retell these big-screen stories, it uses the comedy, romance, heroes, villains and friendship from these popular films to create a new plot -- a distinguished Hollywood awards show in which memorable silver-screen Disney moments are recognized. There are songs from Hunchback of Notre Dame, Toy Story, Pocahontas and Lion King, together with those from Snow White, Sleeping Beauty and Lady and the Tramp. The show leaves the boundaries of the stage and moves right out into the theatre. The Fab 5 are joined by Tarzan, Mulan, Snow White and others including an appearance by Stitch in his Elvis regalia. A salute to Walt Disney and his legacy of animation magic, this musical features many of Disney's most famous and infamous characters. It is a show for ‘children of all ages’, Golden Mickeys is not to be missed. The Golden Mickeys follows a Disney Cruise Line tradition of delivering the best in family entertainment. After the "The Golden Mickeys" show, guests can be part of the Hollywood "in-crowd" at The Golden Mickeys Backstage Pass After Parties -- one for families and one for adults only. Families can rock the night away with live music and participate in sing-a-longs at Studio Sea, while the adult party features more live music and an unforgettable New Year's Eve finale in the nighttime entertainment district.